So, there it is. It is of importance to note that it was a white flag and not the red flag dipped in calf's blood at Waun Fair that was ultimately heralded by the Socialist movement as the first of their red flags. Although, it could have been a white flag on the way up to Waun Fair that was then dipped in blood. The faces of authority at the windows of the Castle Inn were ... anxious as they watched, on 30 May, while hundreds of men, behind a great white banner inscribed Reform, marched through Merthyr and headed out to the Waun. Id. at 101. It was for Reform, not Socialism which had hardly been invented by 1831. And reforms did come. 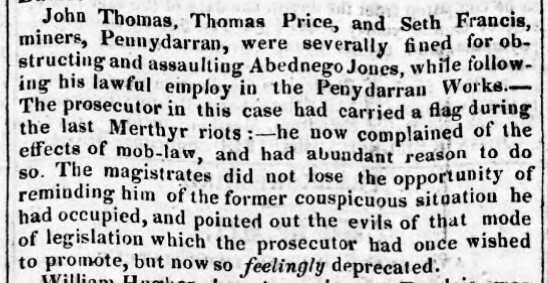 But not until after the red flag at Merthyr; and not until after Richard Lewis, AKA Dic Penderyn died a martyr's death on the gallows in Cardiff for the crime of stabbing a British Soldier. The evidence was questionable at trial. The petitions post-trial to spare his life failed. Historians today generally believe that he was Lord Melbourne's scape-goat for the Rising. A sacrificial lamb. And what of Uncle Abednego? He was 19, not a child, at the time of the Merthyr Rising. But 19 is still young and perhaps he was short as Prof. Williams speculates. Legends exaggerate in the retelling. But there is nearly contemporaneous documentation of Abednego carrying a flag. Prof. Williams and I found the same source. There is no other match for Abednego Jones that I can find in the genealogical records. Jones is the most common surname in Wales, but Abednego is rare, even for biblical Wales. I just wish we had the 11,000 names of the petition to spare Dic Penderyn.